Collected by members of Toronto Island History group. 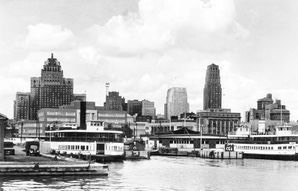 The Toronto skyline of 1957 forms the background for the Trillium and Thomas Rennie moored at the old Toronto Island Ferry Docks near the foot of York St. Note the city’s prominent skyscrapers of the day, the 1929 Royal York Hotel and 1930-31 Bank of Commerce Building. Welcome back, William, Sam and Thomas! It’s been a while (since last May, actually), but thank goodness the “big boys of summer” are back in business. They are William, Thomas and Sam, along with the historic 1910 paddle steamer Trillium having recently completed successfully a mandatory hull inspection. Joining the group is the much smaller — but equally important — Ongiara, being the only one of the boats that can bring the utility vehicles needed to carry out certain work on the Toronto Islands. They all now await the summer crowds and are once again ready, willing and able to ferry thousands to and from the far away island ports of Ward’s, Centre and Hanlan’s Point. By the way, just who are these three — William, Thomas and Sam? William Inglis was a prominent businessman whose Inglis factory was located for many years on Lower Strachan Ave. At that ferry’s launching in 1935, it was originally identified as Shamrock in keeping with the names of the other island ferries of the day, including Bluebell and Trillium and the even more “ancient” Primrose and Mayflower. Following Inglis’ death, Toronto city council unanimously agreed to rename Shamrock and by the time it entered service, it was known as William Inglis. Sam McBride was a long-time Toronto politician who died in November 1936 while serving a second term as mayor. 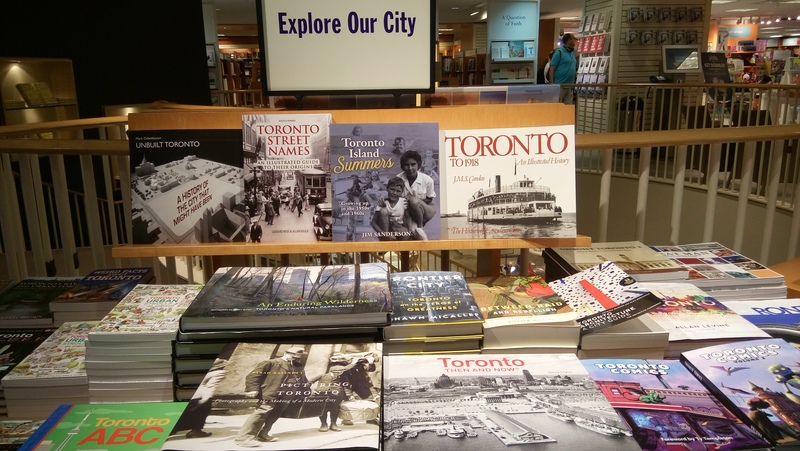 Thomas Rennie was another well-known, well-respected Torontonian and a long-serving member of the Toronto Harbour Commission (now Ports Toronto). This vessel was launched in 1951 and is the newest of the large island passenger boats (although Trillium was rehabilitated and given a new life in the mid-1970s).